My sweet daughter-in-law never ceases to amaze me! 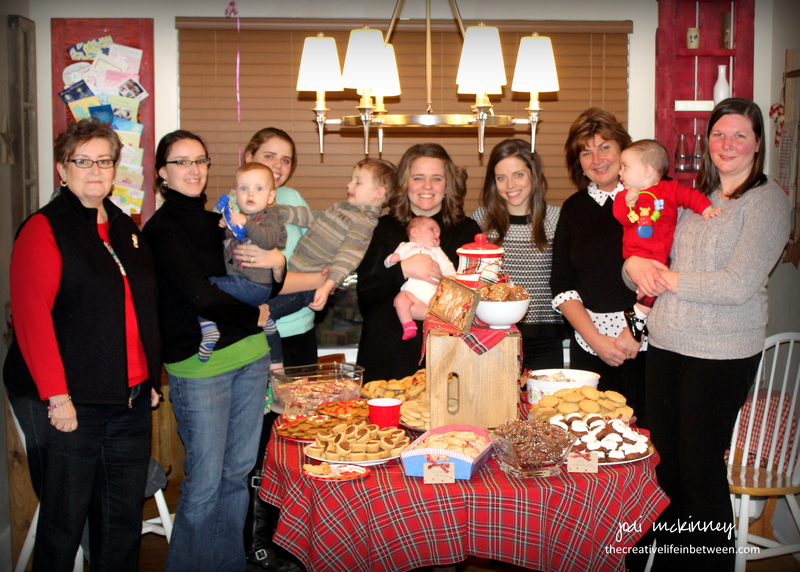 With a brand-new baby, she still managed to pull off the loveliest of Christmas Cookie Exchange parties this past weekend. I am so proud of her. I love that she values creating traditions and memories for her family…. and admire that she does it on a few hours’ sleep each night! This year, three new babies attended the party. Although our granddaughter is the first grandie on our side, she is the fourth on her other side – three of which were born this year! What a joyful occasion. 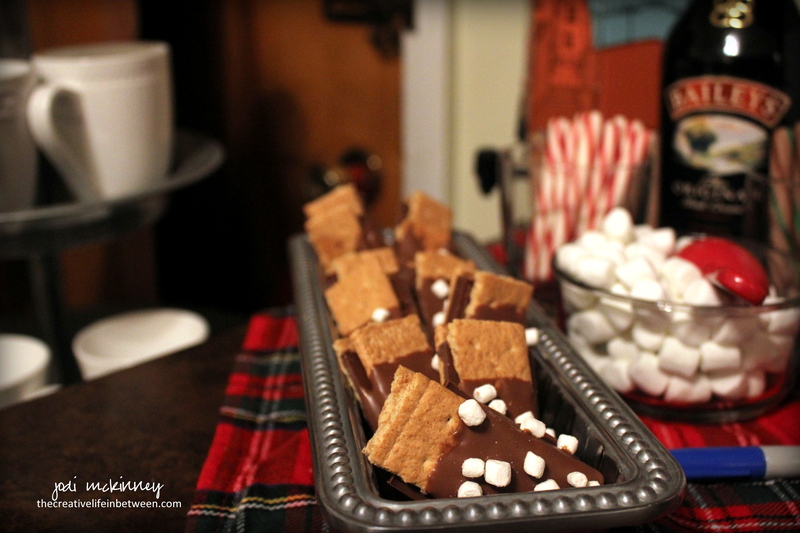 Of course no cookie exchange party is complete without a hot cocoa bar (oldest nephew’s fave – especially when stirred vigorously with peppermint candy cane sticks). And my daughter-in-law’s s’mores cookies made it even more special. 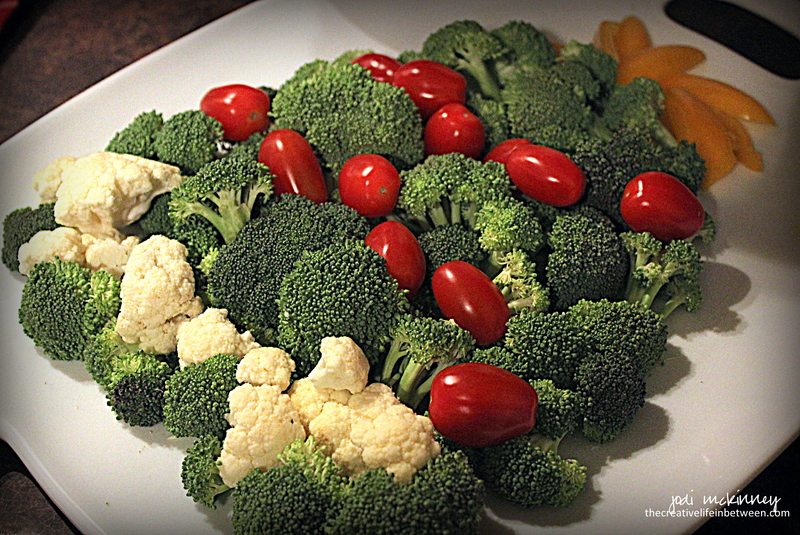 And don’t veggies taste better when shaped into a Christmas tree on the platter? 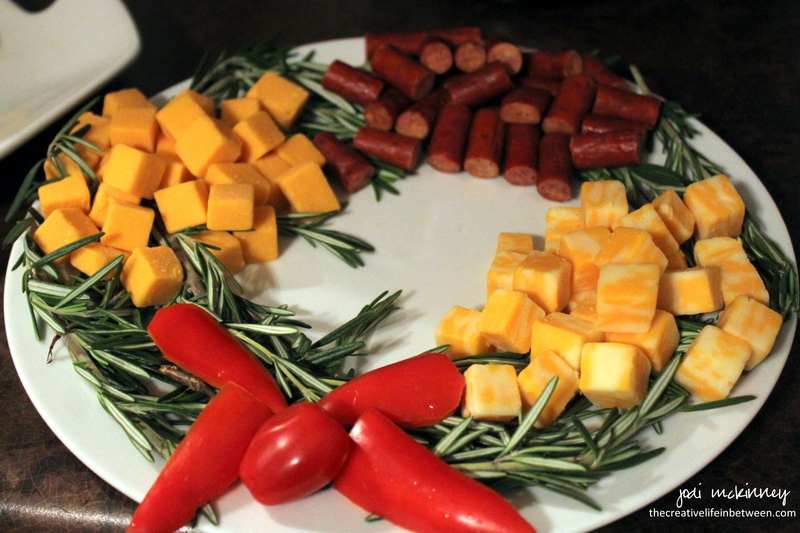 And cheese and sausage on a bed of aromatic rosemary shaped into a wreath? 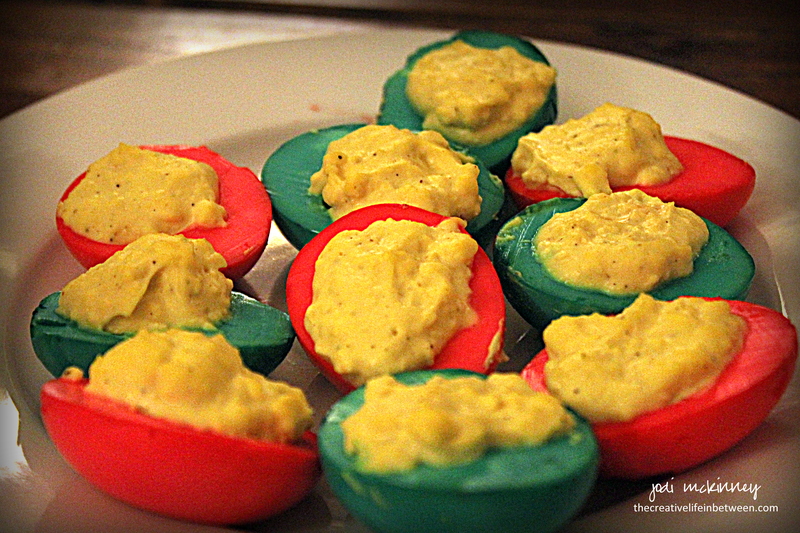 Deviled eggs are more festive, too, when dyed red and green. 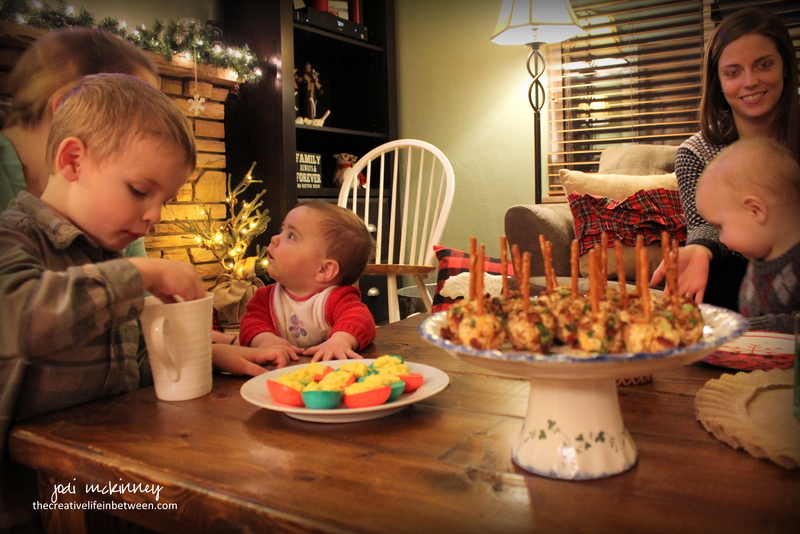 There is nothing like Christmas through the eyes of children and passing down traditions. Lovin’ from the oven! The best kind. Oh this is lovely Jodi! What a fun tradition! Kudos to your daughter-in-law for having the energy to history with a newborn in the house! Everything looks so yummy! What a lovely party! And I saw your tray of cheese balls! 😀 Looks like so much fun! What a wonderful tradition! You really are lucky to have a daughter-in-law who values family traditions and is willing to help make them happen. Beautiful, Jodi–family and fixin’s! I am stealing the wreath idea…love that, and all the goodies! Rosemary is the wonder herb! 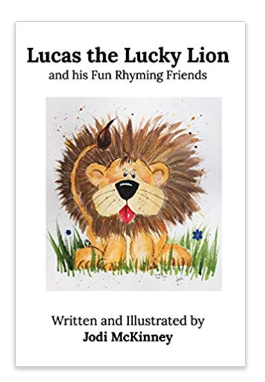 Amazing food and such fun for the entire family! 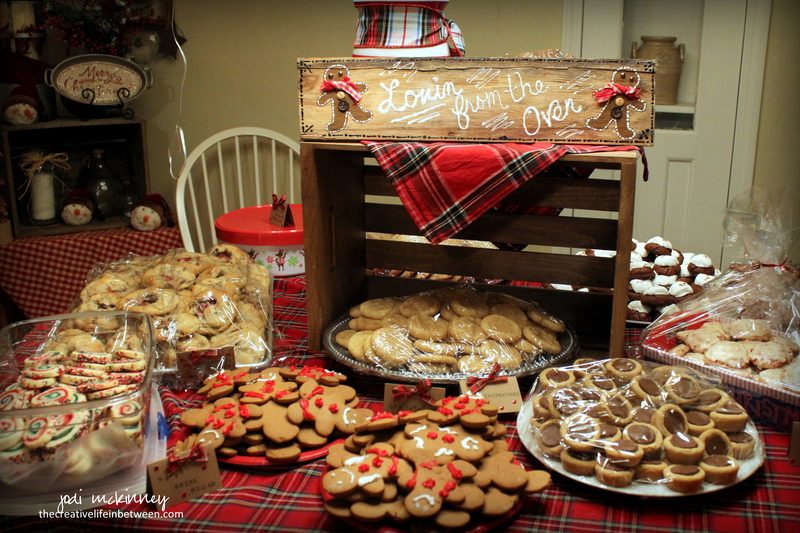 Hi Jodi, wonderful party, all these cookies and delicious stuff. And 3 babies! I’m sure you had lots of fun! she is so amazing! I think you know how much I adore her! LOL! Love the ideas on serving veggies in the shape of a Christmas tree, and I will be copying the s’mores recipe. Beautiful, simple, and I can just see my sweet little Hazel eating those! the s’more cookies are so yummy and super easy! 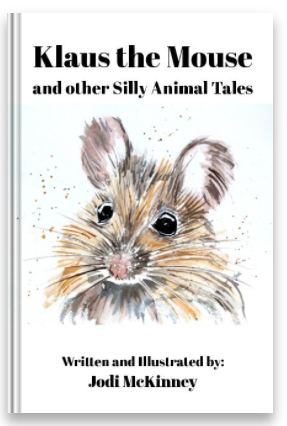 Hazel will LOVE them! Thanks Dawn! Holiday Hugs to you too!